Our friend Beth decided to start a t-ball team in the valley, the first one ever. A bunch of four to seven year-olds turned up the first night to find out what it was all about. Beth had enlisted the help of assistant coaches. They led the kids in running around the gym (the first night was very cold so practice was held indoors) and stretching. Then it was time to divide into groups and start learning how to catch (even if the glove was on the wrong hand), throw, and bat. The kids had a fantastic time. Desert Girl hit the ball well the first two times she swung, and then hit the tee repeatedly. She needs some more practice, I guess. At the end we celebrated that no one had gotten hurt. That doesn't mean there weren't tears, there were plenty of those as kids realized they couldn't have the ball all the time. But they were starting to get the idea of how to play as a team. A couple practices later and it was time to teach the kids how to bat and run around the bases. Parents hung out in the outfield to help direct the kids. The kids didn't have a very long attention span. But before long they seemed to get the hang of running to first base and throwing the ball to first base, and then listening to the first base coach of what they were supposed to do next. The kids are having a great time, and the spectators are getting a good dose of entertainment. I'm already looking forward to the next practice! Thanks so much to all the coaches. Since Desert Girl has ditched the training wheels, she wants to go bike riding all the time. One Sunday afternoon we went for a little ride. She's gotten a lot better keeping her balance and seems pretty comfortable on her bike. So we decided to give her a little challenge at an off-roading place. Desert Boy was eager to take the lead. He showed us last year at Sacramento Pass Rec Area that he has a talent for mountain bike riding. Then it was Desert Girl's turn. I wasn't so sure how well she would do. And I was quite aware that I had no bandaids with me. This could turn out really ugly. I held my breath as she started down the hill. She started gaining speed and going over bumps. Her front wheel wobbled, but she hung on tight, Barbie basket leading the way. And she kept going. She didn't quite make it up the hill, but she was pleased as peaches that she made it down the hill. She even did it again. I think we've got another future mountain biker. The main irrigator for a remote area of the ranch was injured in a car accident, so my husband has been spending a lot of time down there, including Sundays. So we've all been going down there on Sundays so we can at least spend time as a family. The kids and I tend to find the irrigating not so exciting, but there are other ways to amuse ourselves. I really like looking at the birds, and I was delighted when my husband pointed out this bird. I had to take a better look to recognize it as a great blue heron. I'm used to seeing them on the ground or flying, but great blue herons do nest in trees, usually in huge rookeries, sometimes with hundreds of them together. This one was all by itself. Meanwhile, the kids were finding some obstacles. Then they decided to build a fort. They love building forts, and they usually get along well together when they do. Eventually my husband finished the irrigating, and it was time to leave. The kids begged to stay longer to make their fort better. When we were driving away and realized our gas in the truck was low, Desert Boy suggested we could go back to the fort and hang out there, after all it was good shelter. If he ever gets lost, he'll probably do okay for himself! 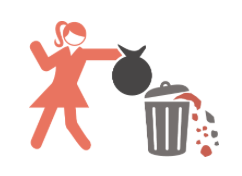 Let's help our Planet Earth by making less garbage! One of my favorite things to reuse are clothes. Most pre-owned clothes have lots of wear left in them. Recently I've been introduced to two online stores that sell pre-owned clothes, Schoola and ThredUp. I've used both and have been happy with them and recommend them to others. True, finding reusable clothes close to you will be even better for the planet (as shipping causes carbon emissions), but if you aren't finding what you want or you live out in the boonies and don't have nearby thrift stores, these two websites might be a great opportunity. Plus they both have sales right now! Schoola offers preloved kids clothes at up to 70% off retail with 40% of proceeds benefiting schools. You can get free shipping with orders over $50, but for a limited time, shipping is free for any size order. Use the link here and you get a $15 credit for your first order. (And if you invite friends you will also get a $15 credit.) With the $15 credit and free shipping, that means you can get one or two pieces of clothing for free, including shipping! 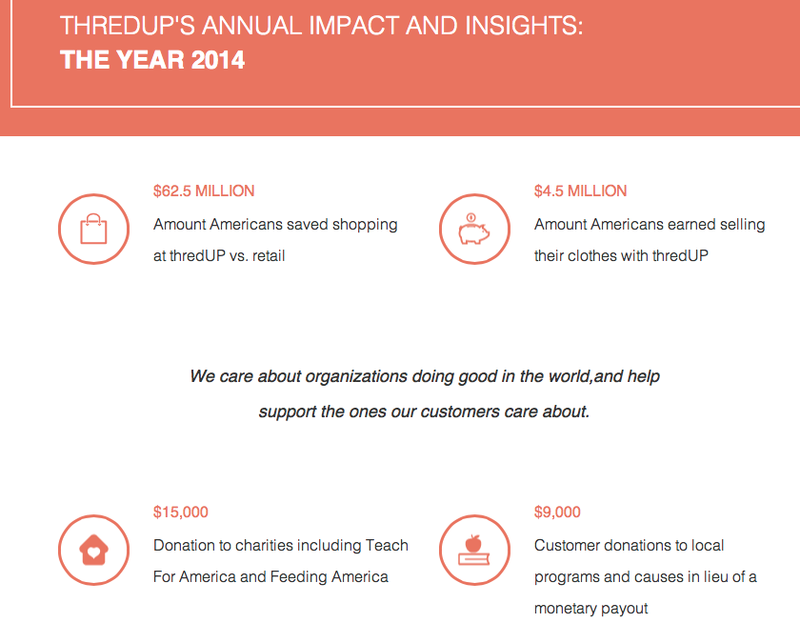 ThredUp is the largest online consignment and thrift store. They have girls, boys, and women's clothes. Ending at midnight tonight (4/22), you can get 20% off your order, just use code EARTHDAY. By clicking on the link here, you get a $10 credit for your first order. (And if you invite friends you will also get a $10 credit.) They have free shipping on orders over $70 otherwise shipping is $5.99. ThredUp gets clothes by having customers send in clothes to sell. I gave that a try and filled a bag (prepaid shipping) with the specific brands they accept (check their website). What I found is that they are extremely picky and only accept the very best (4 of my 15 items, all of which were in excellent condition). I thought the other clothes I had sent were plenty good to be sold on their website, but apparently they know what sells best (and maybe I'm not as trendy as I thought! ;) Nevertheless, I now have a $12 credit to use with them, donate, or get via Paypal, and that's $12 more than I had before, plus my house is a bit emptier, which is a really nice feeling. Clothes that aren't accepted are passed on to a third-party reseller. I'm loving that reusing clothes is also saving so much water, especially coming from a water-starved area! Note: affiliate links in this post--you don't pay any extra, but if you click the links and order, I get a small reward that makes me a happier blogger. And a happier blogger means more posts! Before the train ride, we had an opportunity to tour the East Ely Railroad Depot Museum, which is separate from the Nevada Northern Railway Museum, and the Engine House tour, both of which are also recommended. We went up the steep steps in the depot and found that the museum encompassed most of the second floor. They had lots of old office equipment from when it was a functioning depot and saw 44 trains go by a day. The kids moved quickly, but were interested. One of the highlights was when the volunteer showed us the safe room. We saw the biggest dictionary we've ever seen (sorry, I didn't get a photo of it!). The photos along the hallway were also impressive, taken by one of the volunteers of railroad scenes across the West. Below is another office. They pretty much just got up and left the depot as is when it closed, so it is full of historical items. Later we had a chance to play on the new playground across the street. What a great place for a playground. They had some cool swings that looked like horses. The kids "galloped" for awhile. Desert Boy couldn't resist climbing. Then it was time to try the spinners. They made me too dizzy, but the kids loved them. We ended up having time to swim a little, stop by the Art Bank (their changing exhibits make it worth a stop every time we go to town), and of course a grocery store visit. Often we only get to the store once every couple weeks or so, and this was one of those times where we were really short on fresh fruits and veggies. The light on the drive home was spectacular. I stopped at the gate to Horns-a-Plenty to check it out and the cool clouds in the background. Horns-a-Plenty makes some awesome chandeliers, as well as lamps, candelabras, and more. Nearby was a super cool gate, with elk silhouettes by Silver Jack Ironworks. It was a great way to end a lovely day. We needed to go to Ely and I asked the kids if they wanted to ride the train or go swimming. They both chose to ride the train. (Wow, that says a lot since they LOVE swimming!) We got our tickets early, as it happened to be a free day for locals, did some errands, and then headed back. We found one of Desert Girl's friends to join us for the ride. The kids love getting their ticket checked by the conductor as they board the train. Once we got on, we found another surprise: more friends!! What a great day. It was also volunteer day on the train, with several booths set up in one car showing off volunteer opportunities. The girls found some fire chief hats. Desert Girl had decided the day before she was also going to wear a cape. I think capes are always in fasion. After awhile inside, we headed out, where the girls posed. It was a beautiful day for a ride, and the train was nearly full. Engine 40 took us easily up towards Ruth. The mine tailings at Ruth are always impressive. Basically they moved a mountain to extract a lot of copper and a little of some other metals. We opted to spend most of the downhill trip outside. But first we had to turn around. We backed up, the engineers watching closely. The little yellow caboose led the way. We backed into Keystone Gulch, population 20. No, make that 18. Or maybe 17. Fortunately the gallows were empty as we visited the little town. On that afternoon, the population was zero. But some bandits appeared and wanted to know if anyone would join their gang. No one did, so we headed back to Ely. We did pause as one guy got kicked off the train. We were all impressed. If you misbehave, you have a long walk back. Fortunately everyone in our group stayed on the train. We saw some smaller mines on the way back. The tunnels are always highlights of the trip. We noticed a fire truck as we went along town. Then we saw a big blackened area--a fire right next to the tracks! Did the train start it? I don't know, but fortunately the fire fighters kept it contained. …and enjoyed the scenic views. Have I mentioned it was a really beautiful day for a train ride? All that was left was to get on the right tracks. One of the conductors got off to throw the switch. Then we had a big steam blast, and before we knew it we were back at the station. It was a very relaxing couple of hours with beautiful scenery. The trains run all summer and into the fall. For more info, check out Nevada Northern Railway's website. All aboard!